Cotton Poplin is a popular shirt choice for many, and our Blue and Sky Windowpane Check is a firm favourite with our customers. Great for business wear and smart casual, it’s a versatile shirt that will make a great addition to your collection. Our bespoke shirts are hand tailored to your preferences meaning every shirt is unique to you, you decide on fit, collar, cuff and sleeve length and leave us to take care of the tailoring. 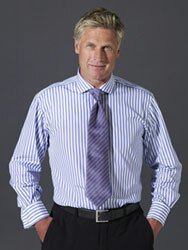 As a crisp and medium weight cloth, Poplin is a durable and versatile shirt fabric. The standard weave makes the blue colour pop against the white making the Windowpane Check stand out and work well with a blue suit.